It is a five mile drive to the El Paso County Clerk's office from Blue Skies Inn. It takes about ten minutes to apply for your marriage license. Both parties must apply in person (or one party may apply by affidavit). You will need photo ID's and your social security numbers. Cost of license is thirty dollars. If you are a Colorado resident, you may obtain a marriage license from your own county clerk. If one or both of you are in the military and not currently able to apply in person for a wedding license, you can download forms and have your commanding officer notarize your license application, as authorized by Colorado statute. For other couples who are, for one reason or another, not able to be legally wed on the date of their ceremony, A Pikes Peak Wedding provides a Ceremony Certificate, inscribed with the wedding couples' sentiments and suitable for framing. This Ceremony Certificate (Sometimes referred to as a Ribbon Certificate) is signed by the wedding couple and their officiant to memorialize the occasion, leaving the legal niceties to be resolved at a more convenient time, if ever. Both parties must complete and sign the marriage application form. At least ONE of the parties must apply IN PERSON before the Recording staff. If one of the parties cannot appear in person, he or she MUST complete an Absentee Affidavit with a notarized signature and provide a copy of valid identification showing proof of age of the absent party. If either party has been divorced, he or she must recite the date the divorce was finalized, city and state divorce took place, and the type of court. A divorce decree is not required at the time of completing the marriage application. Couples themselves may solemnize their own marriage (C.R.S. 14-2-109). Marriages can also be solemnized by judges, retired judges, magistrates, public officials authorized to perform marriages, or in accordance with any mode of solemnization recognized by a religious denomination or Indian Tribe or Nation. Not anyone can solemnize a marriage. Although the couple may solemnize their own marriage, that does not mean a friend or relative, who is not otherwise authorized to perform marriages, can also solemnize their marriage. Clergy from out-of-state need not be registered in Colorado. Note: "Solemnized" is a technical legal term that refers who can sign a wedding license as an officiant. Colorado law providing that couples may "solemnize" their own wedding vows does not mean that someone not qualified to solemnize a wedding under Colorado law may not officiate at the ceremony. He or she just can't sign the marriage license as a "solemnizer." The wedding couple does that. The person solemnizing the marriage shall complete the marriage certificate form and forward it to the Clerk & Recorder's Office within sixty days (60) after solemnizing. Any person who fails to forward the marriage certificate to the Clerk & Recorder's Office shall be required to pay a $20.00 LATE FEE and an additional $5.00 LATE FEE may be assessed for each additional day of failure up to a MAXIMUM of $50.00. 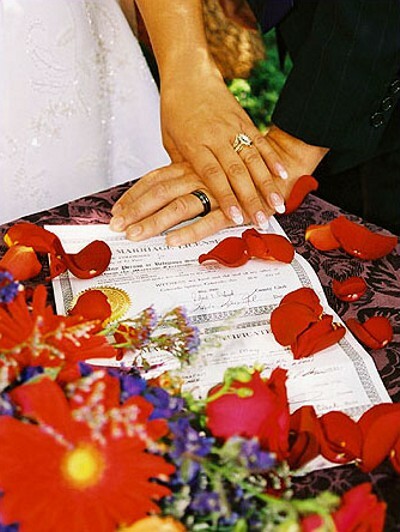 Marriage certificates must include the county and location where the marriage took place, the date of the marriage, the officiating party's signature and title and the bride and groom's signatures.